Welcome to Myanmar. This afternoon, meet your guide at Mandalay Hill Resort at 3:00pm and transfer to the luxurious Scenic Aura. Enjoy a welcome on board reception whilst cruising to Mingun. Enjoy the perfect Irrawaddy River experience as you cruise in all-inclusive luxury on board the boutique Scenic Aura. Sit back and relax as a parade of incredible treasures slips by the window of your private Scenic Sun Lounge. Myanmar is a country few have had the opportunity to visit. Take your time discovering all the earthly (and unearthly) delights that can be found sprinkled across this mystical land. 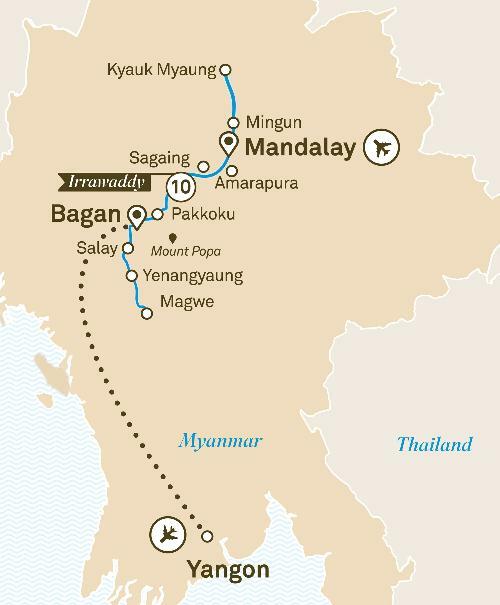 Spend time in Sagaing mixing with local nuns and novices; cruise to the rarely visited Kyauk Myaung pottery village located upstream of the known habitat of the Irrawaddy dolphin, and stand agape at the sheer majesty of the Old Bagan temple complexes. Or, simply stay on board and make the most of your beautiful cabin, fantastic dining and host of facilities.